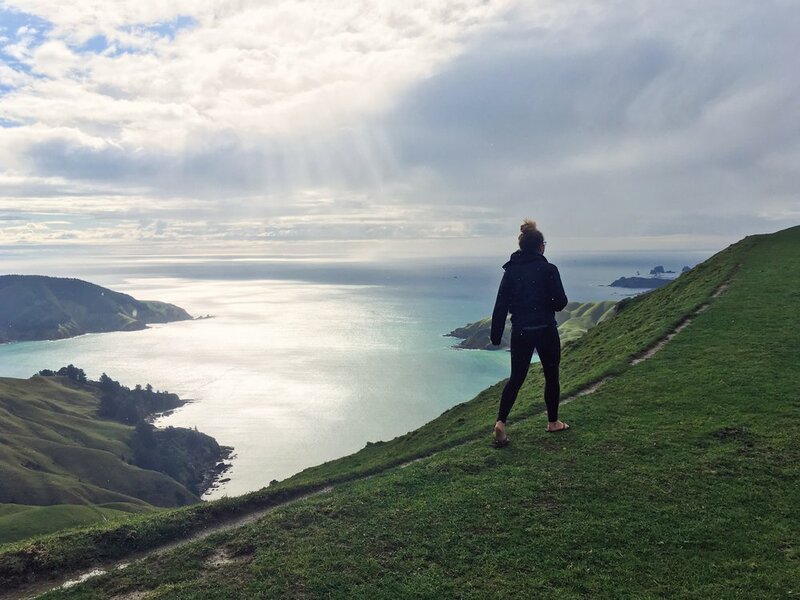 Like so many of these NZ adventures, my recent overnight camping trip to the Marlborough Sounds with the Americano gang started out without a great deal of organization or preparation, a real fly-by-the-seat-of-your-pants operation. I arrived at the Americano household around 11am, but the four of us didn’t actually leave Nelson until after 12:30pm. We made a stop to pick up a sleeping bag and grab some cheese scones, a stop at the supermarket, and trips back to both houses because we needed “just one more thing.” I mean, we very nearly left the tents behind, that's the kind of morning we were having. We joked that the Kiwi mentality is rubbing off on all of us. Throw together the adventure last minute and just trust that “she’ll be right" in the end. That's the beauty of one-night trips though, if you do forget something, like, say, I don't know...a toothbrush, you only have to go one night without it. Anyways, we did finally manage to pull ourselves together and get on the road eventually. It was a clear day with just some spotty high clouds and the blue skies and sunshine sparkling on the waters of Tasman Bay reminded me so much of the first time I drove through Nelson back in January. Of course back then I had no idea this place would become a significant part of my year in New Zealand, but life is funny like that. We drove eastward past Cable Bay, up into the Richmond Ranges where thick forest starts to replace the grassy hills you find closer to town. After crossing from the Nelson to the Marlborough region, we turned north off the highway towards the Marlborough Sounds, paused at a giant blue sign listing the various destinations possible from this point, and continued northward on the winding road into gray skies and rainier weather. 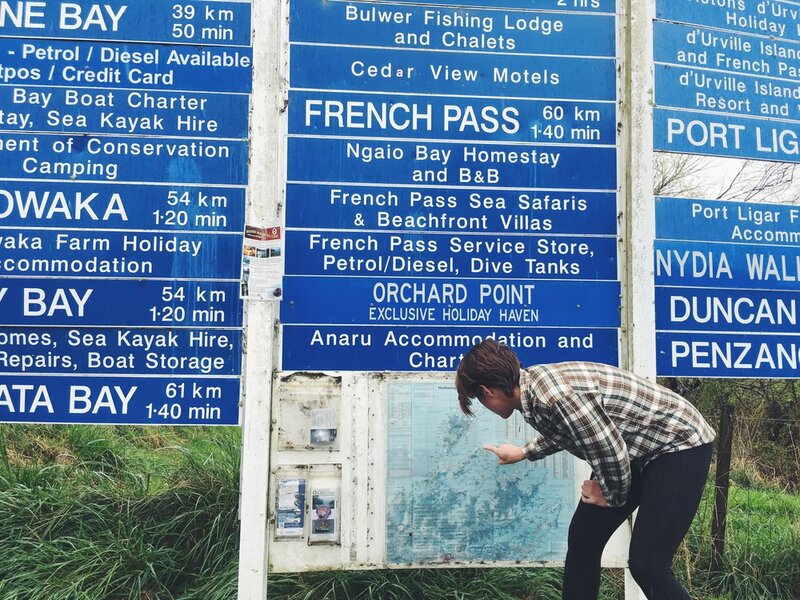 At some point we realized that our level of unpreparedness stretched to not having cash for the campsite on us, so we made a pitstop in Okiwi Bay, the first little village you come across on the way out to French Pass. Okiwi Bay is a tiny fishing community and holiday spot that can't have more than a hundred residents. Needless to say, there was no bank to be found, but we figured someone at the little general store (that doubled as the campsite office) might be able to tell us if there was an ATM around, so we ventured inside. It felt more like walking into a drive-through espresso stand than a store, but it was chock-full of all the bits and bobs you might need when camping, from matchsticks to diapers. The walls around the cash register were covered with posters of New Zealand fish species, maps of the area, and photos, some of which looked like they had probably been hanging there for decades, of people on boats and docks holding up their catches of the day. The friendly store owner told us there was no ATM, but that he could do cashback with a purchase, so we picked up some licorice and a couple of chupa chups. He asked us the usual "where are you from/where are you headed," gave us some directions, recommendations, and then, licorice and cash in hand, we bid farewell to our new friend and drove out of the bay back onto the main road. That's one of the things I really love about traveling in this country, pretty much anywhere you go can count on Kiwi hospitality and a friendly conversation. When someone asks you where you're from and where you're going they're genuinely interested. And maybe it's just my familiarity with the Seattle freeze, but I find it refreshing and surprising every time. As we continued north, the forests gave way to rolling green farmland once again and the road carved its way through sheep-spotted hillsides. By mid-afternoon the clouds started to part and we got a few sunny spots, sunshowers, and of course, those New Zealand rainbows. When I think about it, it’s actually a wonder anyone gets anywhere by car in this country, because at every turn there seems to be a new reason to pull over and jump out of the car because you "just gotta take a photo real quick." One such photo stop on this trip involved climbing over a fence. Now, my friends, if you recall, this is not the first time I have climbed over a fence this year. From previous experience, I recognized that this particular fence was, in fact, electrified. (Oh, hello plastic casing on the top wire, I see you!) So unlike my first run-in with an electric fence a few months ago, this time I climbed over and back and I did not get electrocuted! Applause, please. No Americans were harmed (or electrocuted) in the making of this photo. Just before reaching the campsite we stopped hiked down the little trail to the French Pass lookout, where the powerful tidal flows create swirling back eddies and whirlpools in the narrow pass. 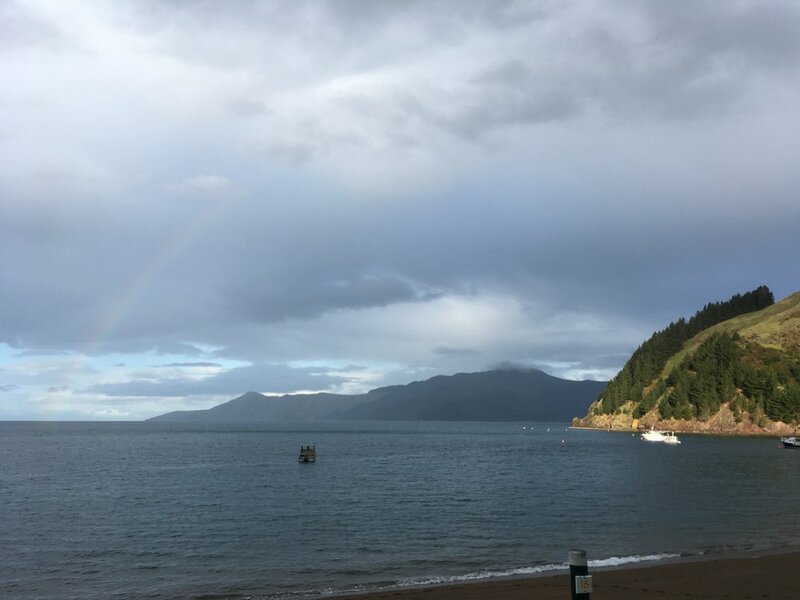 The trail continued on down to a secluded beach that we explored before heading to our final destination, the French Pass campsite at Elmslie Bay that greeted us with...yet another New Zealand rainbow. If Okiwi Bay was tiny, then French Pass was miniscule. There were maybe ten or fifteen houses nestled into the hillside, three boats buoyed up in the bay, a single dock, a community hall, and not much else. I think we saw a total of six other people during the 12 or so hours we spent there. I imagine it's much more active in the summer months, but man, it was pretty quiet on a Tuesday in the low season. We had the site all to ourselves, so two tents and a car were spread out over about four campsites. It rained on and off as we explored the beach, and then when we decided it was time for dinner, we realized that we actually left the camp stove behind. So we laughed, ate all the food that didn't require cooking, and mentally prepared to make it a few extra hours without coffee in the morning. Again, that’s the beauty of a one-nighter, nothing can really go too wrong. We took advantage of the sunny morning and did some beach yoga, ate some brekkie, and then got back on the road. On the way back we stopped for a little hike to Piwakawaka Bay, an easy coastal track starting out from Elaine Bay which, as usual, took about half the time that was estimated on sign at the trailhead. Then we piled back in the car and drove a couple hours back to Nelson, just long enough to finish a few episodes of the podcast S-town (which I highly recommend.) And since I know you were worried about my caffeine intake, we did find takeaway coffee on the way back. Incidentally, it was at the Okiwi Bay store where we got licorice and cashback on the way out to French Pass. So, shoutout to that place, this trip may have been a little more catastrophic without it. There it is, folks, the last adventure with the Americanos while we were all based in Nelson. They've hit the road for their last few months in New Zealand and we'll meet back up in Queenstown for the marathon in November (well, half marathon for me, full marathon for them.) So it wasn't a goodbye, it was a see you later, but it still left me wondering where the last six months had gone. You know what they say...time flies when your visa only lasts twelve months!